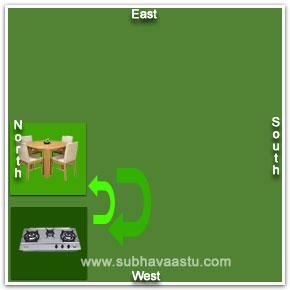 Dining room Vastu: This is another important part of the house which should be carefully planned. It is always good to have the dining room, nearer the kitchen or even attached to it. In this process, care should be taken to place it either at the Southeast Southeast facing house) corner or the Northwest corner or even Northeast (Northeast facing house) corner of the house. The kitchen should not be placed at the Southwest corner of the house. Such a position obstructs one's financial (vastu for moeny) growth and leads to health problems. If one wants to place the dining table at the center of the house, it can be done but care should be taken to see that it is placed towards the Southwest corner. In some places, the dining room may be on the upper floor and the kitchen is at the ground floor, this is not the correct one to carry the food crossing the staircase. 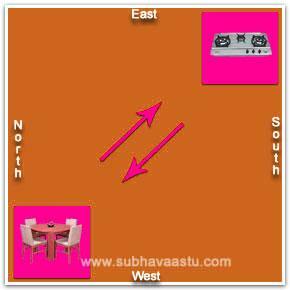 It is most profitable to have the dining room in the east (vastu for east facing) or North or better one may be pleased to get precise guidance from expert vastu consultant. Regarding the placement of the dining room at west (vastu for west direction) side of the building is also advisable if the kitchen is towards Northwest. While taking food, the head of the family should sit towards the West side and facing towards East direction. Other family members should sit facing the East or North direction. 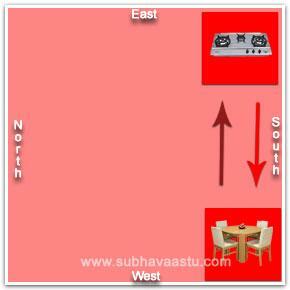 However, nobody should sit facing the south (South direction house vastu), if it is done, (Matter is from SubhaVaastu.com) unnecessary simple quarrels may take place in the house. Be sure if there is a door towards Western Northwest to the Kitchen. Quarrels may not possible if the door to the kitchen is towards Northeast-north direction. Serving food to the Cow is too good to the entire family, before we start taking the food, some quantity may be offered to birds and animals etc, some animals may be satisfied in such places, nature is a powerful and great, if the elements of the nature satisfied then the entire building will have more positive powers support. The dining hall should have a door in the east, the north or the west. There should be no arches towards West if the dining room is towards South direction placement. 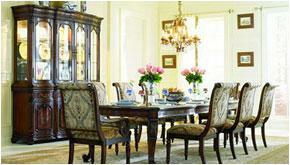 The dining table may not be a round shaped, egg-shaped, hexagonal or of irregular shape. It should be square or rectangular in shape. It should not be attached or folding with the wall. Regarding the shapes, it is advisable to have the rectangular or square because dishes may imbalance and may fall down. Otherwise, you may go for any shape of dining tables. We saw many different shapes of dining tables in foreign countries, nothing bad happen there with this unshaped dining tables. (Matter is from SubhaVaastu.com) What happened if the dining table will be round shaped, if it is so, there is no good enough space for the dishes, then the dishes may fall down, unnecessary reactions may happen with this unshaped dining tables, if you are comfortable with any shape and good enough space to the dining table, then any model is perfectly acceptable. Beware dishes should not fell down while taking food. Otherwise, you have to clean them, your family members may not co-operate, they already done the cooking. In some houses (vastu for house), men are the masters in cooking, that case is different. Placing water at the Northeast corner is good at the dining room. Hand wash basin should be in the East or the North, it these places are not fit then one can plan it anywhere but it should be near to the dining table. If the room is so wider then avoid placing the wash basin at Southeast or Northwest areas, if the room is too small or comfortable with your dining table, then you may place the wash basin at your convenient places. There should not be any attached toilet having the western commode with the dining room, there is no harm if any attached room used for washing clothes or utensils. The door of the dining room and the main entrance doorway of the house should not be facing each other directly. The walls of the dining hall should have light blue, yellow, saffron or light green color (vastu for colours). Some males preparing food just like an expert, their food is tasty. We observed in many families from Kashmir, food is prepared by males, their prepared food is very tasty. We can observe " Swayampaka" in Uttaradimutt etc, only males make the food, while they cooking food they won't allow females inside the kitchen. If females touch any food item, again males started the entire process after taking a second-time head bath. It is said to be "Madi", a "traditional distance maintaining". 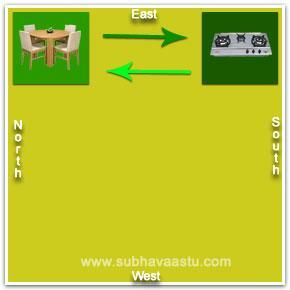 Here the Dining room comes into many places except Southwest (Southwest house vastu) corner of the house. Better to avoid the dining room at southwest corner. If the kitchen is towards northwest (vastu for Northwest homes) corner then the dining room is best fitted towards Northwest , North, Northeast corners. 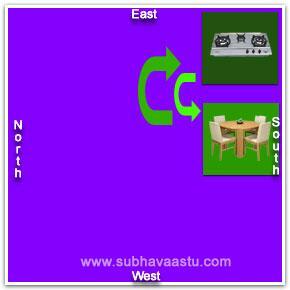 If the Kitchen is constructed (vastu for construction tips) towards Southeast then the dining room is best fitted towards Southeast, South, East and Northeast corners. The main important point in dining room is, bigger windows are suggested and recommended. Good climate, mild music are suggested at dining room. Many people now taking food before TV, this is not correct. In TV there are many channels now tale casting cruelty, sensual feelings, horror etc, while taking food we should not see these scenes. Now the dining area is extended towards Southwest parts, there is enough space towards Southwest part, please note that if you have bigger house, then only it has to move towards little bit Southwest, but there should be another room at Southwest used for Bedroom or Store room. House size is important here. We cannot compare entire houses into one way, there are many houses smaller and bigger in the society. Based on sizes, flexibility in changing the places noticed. The kichen is towards Southeast, the dining room is towards Northwest, just now we discussed that the kitchen best place is Southeast and no problem if the Dining room came into Northwest, positions are correct, but accessing is wrong. 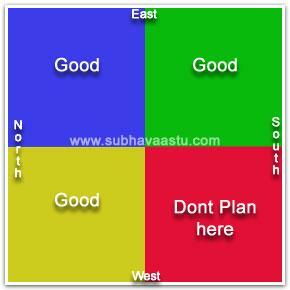 It will be clearly defined by an Expert Vastu consultant. He will suggests where is the best place for dining and kitchen in the house after visiting the property. Now check this image, kitchen came towards Southeast and Dining room placed towards Northeast. Both are in right places. Good accessing. Kitchen is towards Southeast and Dining is towards exactly South. No negative access appears here. You may plan accordingly. But there must be another room at Southwest than this dining room. Please note this point. Now coming to the point, the Kitchen came at Southeast here and Dining came towards Southwest here, wrong accessing. Its not good. Check the 3rd image, same qualities, only changes are kitchen changed to Northwest and Dining changed to Southeast. Wrong accessing. Please aware of these facts. Don't do any practicals with your life. There are vaastu shastra expert specialists in the society, approach them, they charge only one time, but you will enjoy the entire life. Don't see their fees. They charge only one, but if you contacted quacks in the market they charge very less, but you have to pay some thing again and again in the name of vasthu dosh or Gruha dosh. Intelligent people always hear and amends what the experienced people said. 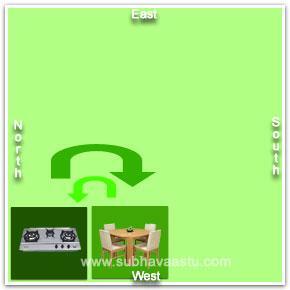 Now the Kitchen is towards Northwest and the dining room is towards north (North direction homes vastu), good accessing. But Northeast-east door or atleast Northeast-north door to the house is recommended here. Kitchen is towards Northwest and the Dining is towards West, good accessing. Here also Northeast-east > door to the house is recommended. Food is energy and our elders always clearly expressing that we should be very careful when cooking food, they are treating the food as "Amruth", we should not comb our hairs near to the Kitchen, it is strongly avoided. You may put some water plants in middle of the dining table, no issues arises. It should not be bigger one, and it should not disturb your food bowls, plan accordingly. Is toilets/bathrooms has any role in vaastu? What are the best places for car parking in our homes? Where exactly we keep our head when we are sleeping? Would like to know more about Vastu Purusha and Mandala? Is North Street Focus properties/houses are auspicious to buy? 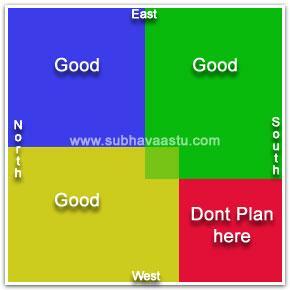 Vastu consultant in Rapid city, looking for best vastu consultant? Which part is the best to keep the overhead water tank on terrace? 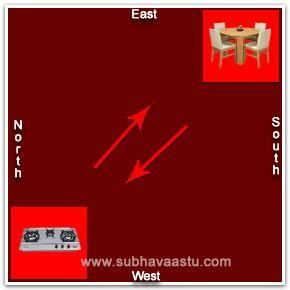 Based on name horoscope which facing home is best as per Vastu Shastra? At present swimming Pool is towards Southwest corner, is it create problems? Found one Northeast-north Street Focus site, can go for commercial construction?